We are pleased to announce the inaugural release of our wines available for sale today. We have worked tirelessly this past year to bring this dream to fruition, and are extremely excited at the opportunity to share these two wines with you. We know you will be pleased with the result: a Pinot Noir and Chardonnay representative of the best the Sonoma Coast has to offer. Our 2011 Sonoma Coast Chardonnay displays a delicate, light straw color in the glass. It carries you through playful tropical fruit accents, subtle vanilla oak, and even floral underlinings of lavender and honeysuckle. Styled in a fresh Sonoma Coast style, this Chardonnay pays homage to its traditional Burgundy roots while remaining distinctly Californian. The 2011 Sonoma Coast Pinot Noir strikes the glass with a toasted cranberry color and cherry blossom bouquet. Enjoy red cherry flavors evolving into a red raspberry mid-palate and finishing with hints of grapefruit zest and soft tannins. This wine represents the Sonoma Coast, a region that allows the fragile Pinot Noir grape to fully express its subtle character with a light acidity that carries through to the finish. We are very pleased with how the wines turned out, and we know you will be too. Our 2011 vintage is very limited so be sure to get your order in as soon as possible; orders will be limited to 6 bottles of each varietal. Our Chardonnay will ship this month to arrive in time for Thanksgiving when ordered by November 15th. Our Pinot Noir will ship in December to arrive in time for Christmas when ordered by December 15th. 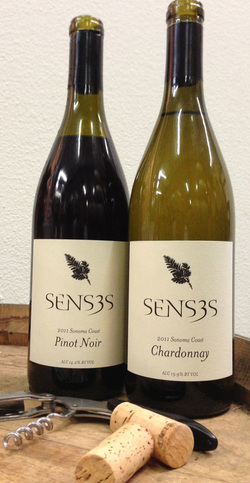 Orders can now be taken at our website:www.senseswines.com. We thank you for being a part of our inaugural vintage and look forward to seeing you on the road to fine wine and good company!